Professional-grade axe for felling, light splitting and limbing. 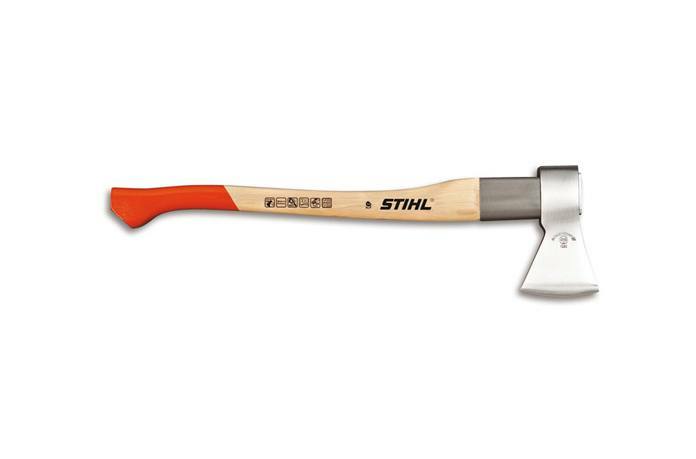 For heavy-duty forestry work, you need an axe that’s built to last. The STIHL Pro Universal Forestry Axe features a unique 5-piece head attachment system that’s up to 2.5 times stronger than a traditional axe head connection. Its finely crafted hickory handle will help you get into the swing of things, while its long steel sleeve dramatically increases handle durability. The head is forged from premium C60 steel for higher durability, then shaped to feature an extra-large striking face for improved splitting performance. It’s the wood axe to have on hand when felling trees, limbing them, doing some light splitting work, or driving plastic felling wedges. Weight Of Cutting Head: 2.8 lb.